A reward for the person who shot and killed a rare red wolf has jumped to $16,500 as other groups have pitched in to the cause. The wolf was found dead Dec. 21 in the Pocosin Lakes National Wildlife Refuge. An examination indicated it likely had been shot two days earlier. The U.S. Fish and Wildlife Service offered $2,500 for information leading to a conviction in the case. Defenders of Wildlife matched that amount. Since then, the reward has been increased by $7,500 from the Center for Biological Diversity, $2,500 from the Animal Welfare Institute, and $1,500 from the Red Wolf Coalition. Landowners can kill a red wolf if it attacks livestock or pets. Red wolves also have been shot after being mistaken for coyotes. Nine wolves were shot and killed in 2013. The combined reward that year rose to $21,000. No one was prosecuted for those shootings, Prater said. 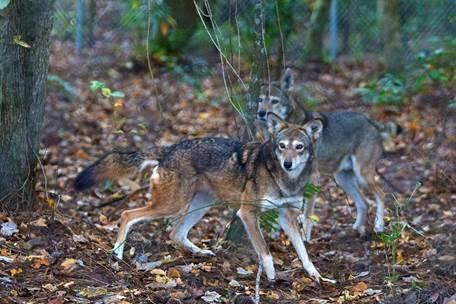 The first wild red wolves were placed within five rural eastern North Carolina counties in 1987. The population grew to more than 100 animals over the years. But the number roaming the 1.7 million acres has fallen below 50 animals, less than half the number counted four years ago. Wildlife groups have filed suit against the U.S. Fish and Wildlife Service since the decline. Opponents of the preservation effort maintain that the wolves have mixed with coyotes and no longer are a separate species. Anyone with information on the recent shooting can call federal wildlife officer Frank Simms at 252-216-7504 or special agent Jason Keith at 919-856-4520, ext. 34. This entry was posted in News, Southeast-Red Wolves. Bookmark the permalink. Error: Error validating access token: Session has expired on Friday, 22-Mar-19 12:26:11 PDT. The current time is Sunday, 21-Apr-19 03:16:24 PDT.